DrPHealth: Early Child Education – why is Canada the worst? Speak to any pediatrician, public health professional, educator or social worker about what would be the best investment we can make in the health and wellbeing of our children? if Quality child care does not top their list it will likely be second. So why is Canada so resistant to implementing such a program? Nationally a program was thought about in the 80's, announced in the 90’s, the foundation built in 2003, and then slashed after the 2005 shift to the right. The only province that has taken up the cause is Quebec. Canada now ranks dead last in OECD countries in public support for early childhood education. Over a time period where the wellbeing of children is sliding backwards, school preparedness is decreasing rather than increasing, and schools laying claims of increasing behavioural problems and poorer school performance, it is at best a disgrace and an embarrassment. What in the minds of some is a social frivolity and drain on public resources, is in fact both a social and economic necessity. The evidence abounds. The value has been demonstrated now for over 50 years. Were this an issue of a few people in a long term care facility that suffered from poor care, a community with unsafe drinking water, or a child in care treated poorly, there would be a national uproar, public inquiries, law suits and legal actions abounding. Why then, has a generation of children been abandoned in Canada? And not only has programming not responded to the science, it has contracted. A cohort of nearly a half million children a year denied the opportunity for reaching their full potential – and no adult standing up taking responsibility or even fingers being pointed at the causes. We have members or parliament and senators rebuked, censored, resigning and occasionally criminally charged for spending a few thousand dollars inappropriately – yet no accountability for the loss of a future generation’s wellbeing! 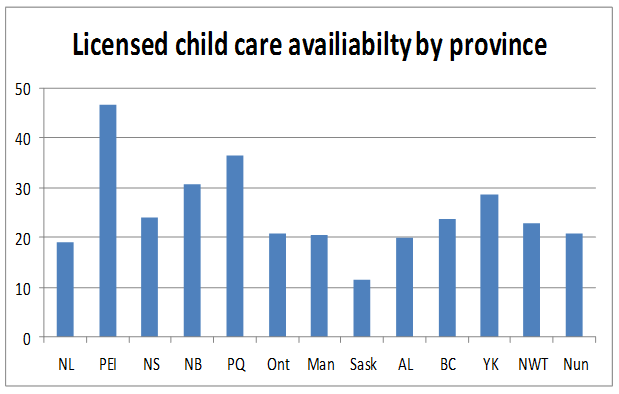 As a starting point the following two graphs provide a snapshot of the high variability in the country on quality child care availability (as a percentage of children who have access to a space) and cost. Quebec the stellar performer and the example of how to care for children successfully. A relatively mild Globe and Mail editorial speaks to the need for a program without even mentioning the failure to deliver on a national commitment. 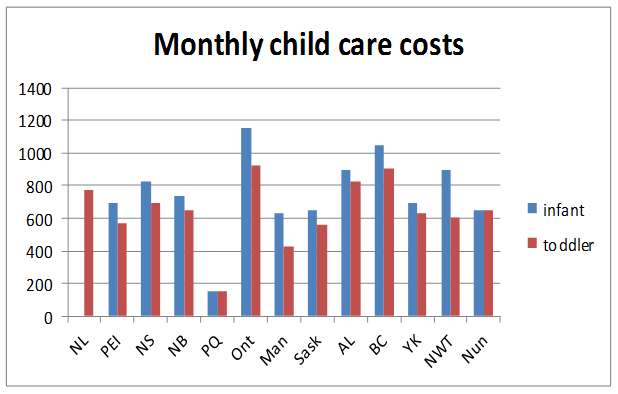 Many would argue the relative economic value of child care is in the range of $3 return for every $1 invested. The social benefits to families are well documented. However in the end, the real benefit is for the child. Provided with a nurturing professional environment in which to explore, build brain function, learn new skills, socialize, normalize behavior and be physically challenged carry lifetime benefits for both the child and the society in which they will thrive. Why then can anyone be so resistant to doing the right thing for our future? From a Twitter reply and so worth mentioning "Yet child care workers are so underpaid and undervalued. Best early investment there is really".